← No Veneer? Have No Fear! We bought our Duncan Phyfe dining set and buffet from an angry man. “This stuff is classic, but my wife wants oak,” he fumed. He was annoyed that we wanted to sit in the chairs before buying, and irritated that we could not fit everything into the truck for one trip. We had to leave the excess pieces outside so we didn’t bother him when we returned. But he gave us a good price, and between that and his mood, we didn’t do an in-depth inspection on each item. We did notice that the veneer on the buffet (UK: sideboard; Chez D’oh: cyborg) seemed to have some superficial water damage, but the piece was solid otherwise. 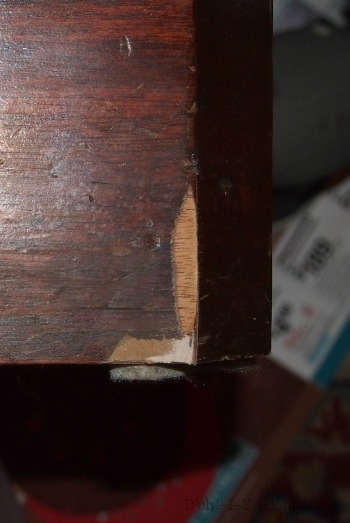 The veneer was all there, just bleached out and loose. And so it has been ever since. We intended to fix this quickly, but the YEARS fly when you have 40,000 home projects in the queue. Recently, I further damaged the veneer, so it sprang to the top of the list. I’ve never repaired veneer, but fortunately, this damage is far enough from the eye that my newbie imprecision won’t be noticeable (or at least not as noticeable as the existing problem). I emptied the sideboard and flipped it on its back. After cleaning the whole piece thoroughly, I carefully scraped out the old glue from underneath the loose veneer. A razor blade did the trick. I pressed the veneer down to make sure it would go back into place and hadn’t warped beyond use. 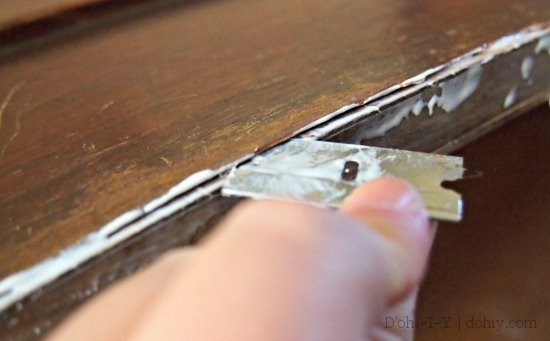 I spread clear-drying carpenter’s glue underneath the veneer as evenly as possible. I pressed the veneer into place, clamping as I went. I also glued in and clamped the broken bits, which were (luckily) shaped distinctively enough to be able to place them definitively. (Here’s info on replacing veneer if you don’t have the detached pieces.) 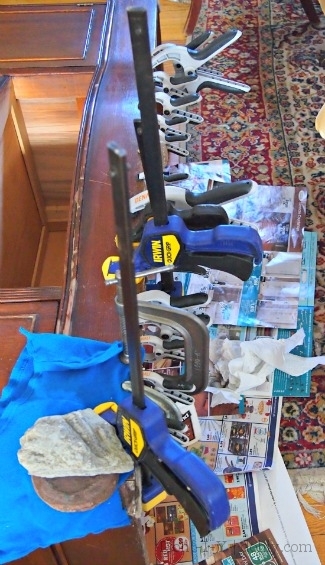 Then I used a WHOLE LOTTA CLAMPS to press evenly around the curved front. There were still a few voids after gluing. I used wood filler on those areas. 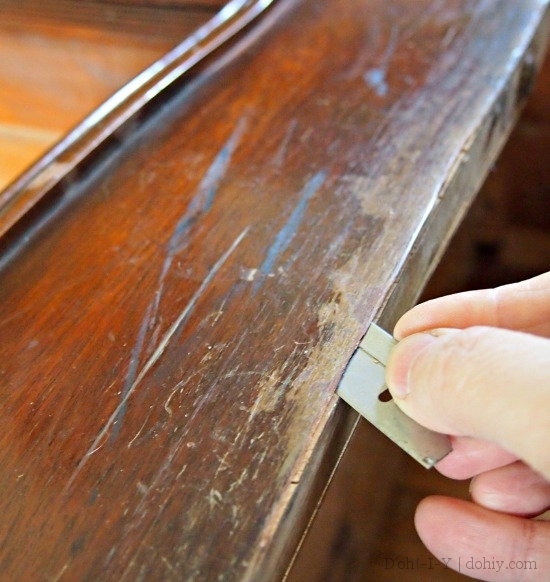 I always way-overfill, but you need some overfill to allow sanding back smooth with the wood surface. And here’s where I screwed something up so you don’t have to! After the wood filler set up, I decided to take the palm sander (with very fine sandpaper) to the whole area. I barely touched one corner and almost ran through the veneer. So…after that, I used very fine sandpaper by hand very carefully to achieve a smooth(ish) finish on the base. I’ve had some practice matching stain colors. I used a combination of cherry and ebony gel stain to match the existing finish. It isn’t perfect, but it blends pretty well considering the extent of the damage. Finally, I rubbed down the whole finish with some Howard Restor-a-Finish in Cherry on super-fine steel wool (UK: wire wool). 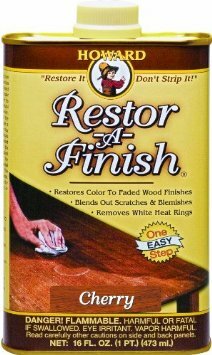 I love this stuff, but be aware that you can’t use polyurethane stains or finishes over it. 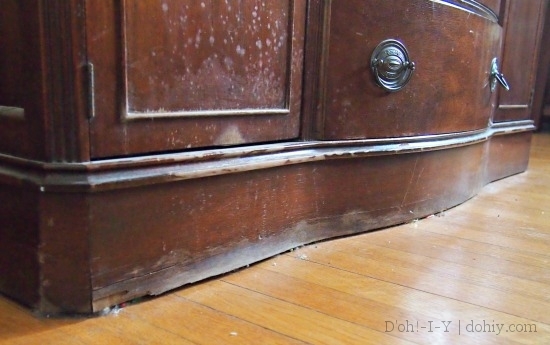 Howard’s is super-easy; apply with the grain using steel wool (to take out minor white spots like those on the door), then wipe off with a clean rag. MADE OUT OF OLD UNDERPANTS. Keep that in mind next time you come for dinner. Then I top-coated with Howard’s Feed ‘n Wax. I put it all back together, and here it is. I know it’s not perfect, but I’m pleased with the improvement on the bottom left corner, where the veneer was the worst. I also took a dent out of the top from the wayward mirror — super-easy! Next time. 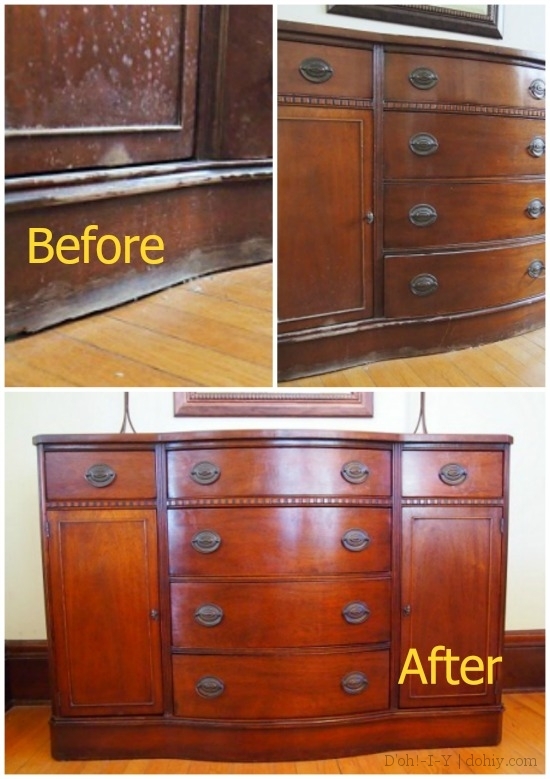 This entry was posted in American vs English, Before & After, Furniture, Repair & Maintenance and tagged fixing loose veneer, matching mahogany stain color, repairing veneer, staining repaired veneer, touching up furniture finish. Bookmark the permalink. Wow! What an amazing transformation. Just goes to show the amazing results you can achieve with a bit of hard work. Love it. Thanks, Christine — but it’s not at all hard work compared to what you are up to these days! Hi Stacey. 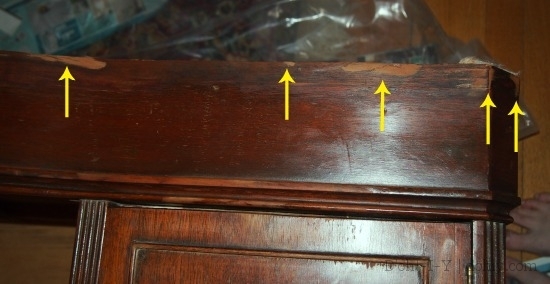 I saw this veneer repair I have a china cabinet that matches this buffet exactly. I wondered if you knew any of the history of this buffet. Mine has the same exact wear and damage as this buffet. 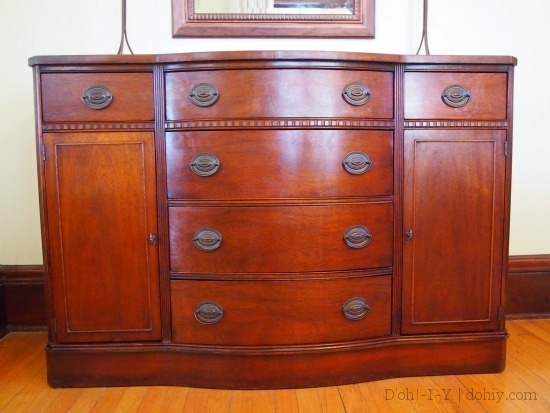 It is the same exact design and pull handles on the drawers. I am so surprised to see this and any information would be greatly appreciated. Hey, Donna! I love that, when I see similar antiques in other people’s houses. I would fall flat on my face if I saw our piano anywhere else (they definitely made more than just this one!). We bought the buffet with our Duncan Phyfe style dining set, although I don’t know if they went together originally. The family we bought it from inherited it from a grandparent, who probably bought it in Minnesota. 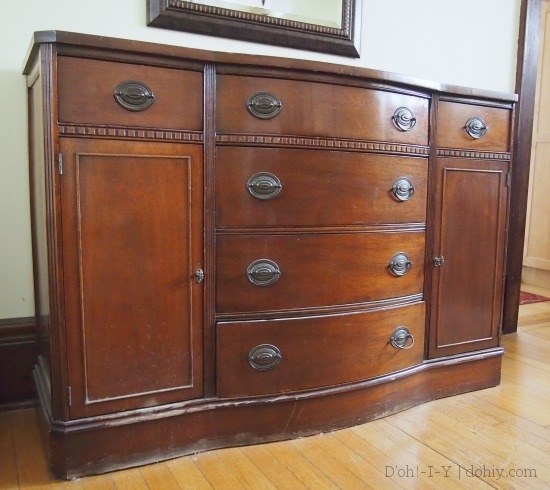 It might have been made anywhere from the 1920s to the 40s, and I don’t see a maker’s mark on it or on the dining pieces anywhere (and I have looked and looked). 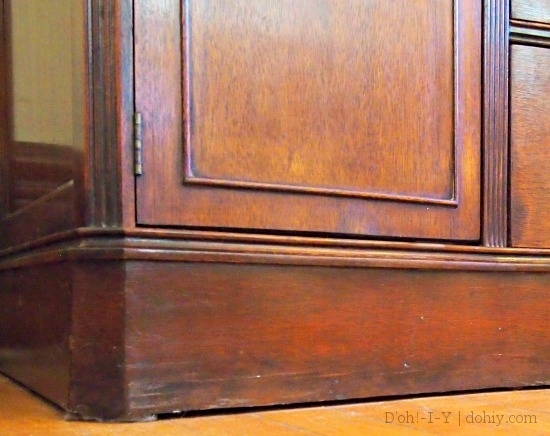 You might find this article interesting: http://www.amgvintagehouse.com/furniture-facts/what-brand-names-are-the-best/. According to the writer, unmarked pieces are common from the first half of the century, but certain features show the quality of the piece. If yours is like ours, it’s built to withstand a direct hit from a bomb, so it’s pretty high quality! I would love to see a picture of yours and hear what you know about it if you have time to stop back. Thanks! You did a great job, can’t even see the part that you sanded through. Thanks, Ian! I am a complete convert to sanding by hand after chewing through that piece. Eek!